Happy Tuesday! My body is humming from another sweaty hot yoga class – what a perfect treat in the winter! Who wants to hear AGAIN that you should eat more vegetables, exercise and unplug?! It’s just so booooring. But, alas, it’s also true. I get it. Trust me, I have looked in every nook and cranny for a magic solution but there isn’t one. Health takes commitment; it takes hard work. But eventually, when you start feeling truly awesome, this hard work becomes fun! And the beautiful upside of all of this is that it’s also simple – we can feel so much better just by taking small, itty bitty steps. 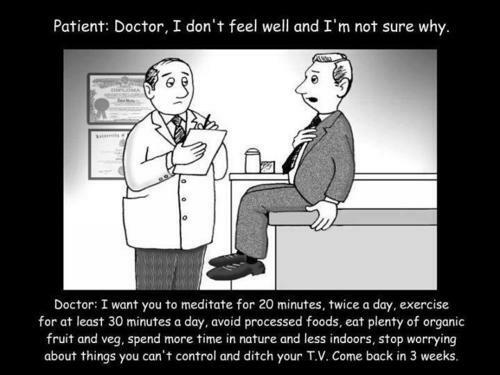 So, based on the Doc’s prescription, what kind act can you do for yourself? What work can you put in towards your health? As for me, I need to ditch my computer!